The Shop-Vac 10-Gallon 4 HP wet/dry vacuum is durable enough for home or job site. Featuring a powerful 4 HP motor, it provides 55 inches of sealed pressure and 130 CFM. 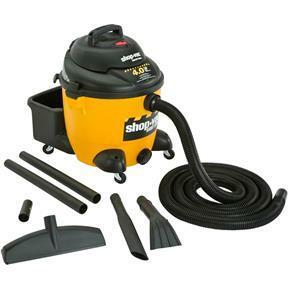 The built-in tool storage bucket includes a 12-foot locking hose, extension wands, crevice and gulper tools, and a 14-inch floor nozzle with squeegee insert. The two-stage filtering system includes a high-quality cartridge filter and a dust bag. The collection tank has side-carrying handles, easy-roll caster system, tank drain, and an 18-foot power cord It comes with a 1-year warranty.